Since launching in 2015, the Matty D. Media team has included a tight group of local artists, employees, and even interns. Right now more than 600 videos we produced are playing on YouTube. Most of those feature Kansas businesses and local causes. Here are some important players contributing to Matty D. Media’s growth. Most of the 4K video productions you see on our portfolio feature the stunning cinematography of Eric Scherbarth. Eric Scherbarth has over fifteen years experience shooting and editing digital content. He has a Masters in Fine Arts in Film Production degree from Columbia University. Eric is a director of photography during cinematic productions at Matty D. Media LLC. Among others, Eric’s camera work shines in works for the Kaw Valley Farmers Market, Construction Specialties and K-State Research and Extension of Douglas County. 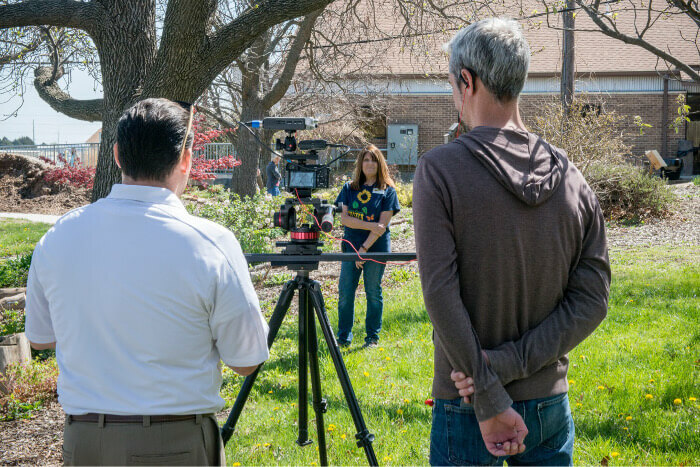 Cinematographer Eric Scherbarth manages a 4K video camera and a dolly track slider during a video production for K-State Research and Extension, Douglas County. Eric Scherbarth began his film career in New York City where his clients included Yelp, Zillow, AT&T & Rutgers University. Eric moved to Lawrence, KS in 2015 where he began working within Lawrence and the Kansas City Metro. Are you looking for a job in multimedia? We’re always interested in partnering with local freelancers and has ongoing job openings. Click here and send us a note! 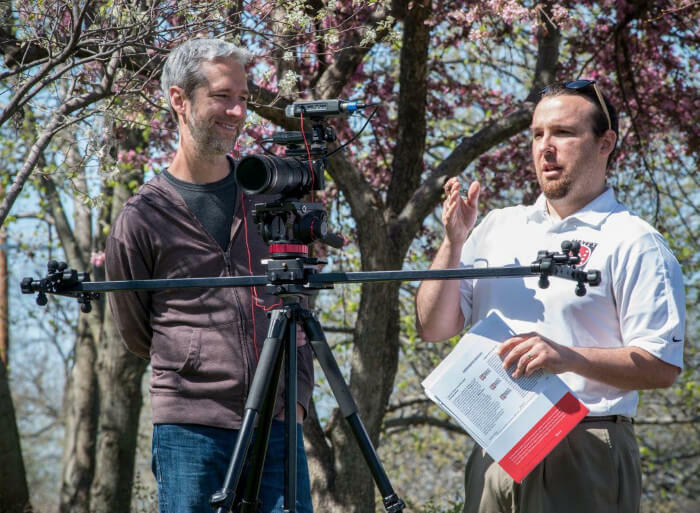 Cinematographer Eric Scherbarth and director Matt DeSarle work a video production for K-State Research and Extension, Douglas County. A very important part of our business is video editing. Lindsey Peavler is a video editor who we trust to deliver on the client’s vision. 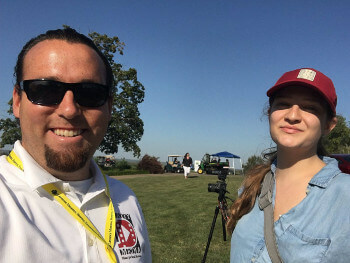 Lindsey Peavler is a videographer and video editor from Kansas City. She graduated from The University of Kansas in 2015 with a BGS in Film and Media Studies and a Minor in Business. Lindsey began freelance video editing in Kansas City after her graduation working for local organizations, businesses, and production companies. She works with Matty D Media on projects from start to finish with a big focus on video editing. Lindsey provides attention to detail, valuable decision making, and is always on top of contemporary trends in her edits. 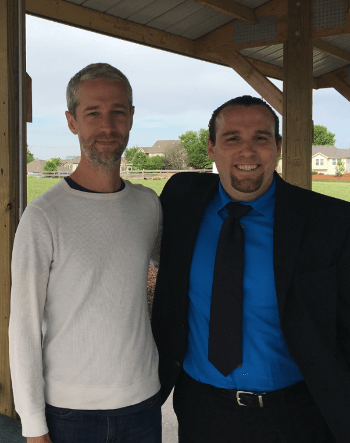 Austin Mitchell-Goering started working with Matty D. Media in 2016 as an intern with The University of Kansas Film and Media Studies program. Austin’s filmmaking style includes a blend of high paced action and a sharp focus on detail. Now an independent filmmaker, Austin works for sports brands such as The Lacrosse Network. He continues to work with Matty D. Media on special projects that require stabilized cinematography of action shots in the field. For example, Austin “went underground” to capture a foundation repair crew at work. Watch this video. You’ll “dig” Austin Mitchell-Goering’s cinematic style. Are you looking for an internship in video marketing? Matty D. Media has worked with The University of Kansas to host an internship program and is open to more. If your school’s communications or media department is looking for new internship sites, please click here and send us a note. We are willing to pay interns for their time! In addition to cinematographers and editors, Matty D. Media builds video production teams to fit small business needs. We work with Lawrence Kansas, photographers, graphic designers, voiceover artists, and other creative talent to match our client’s aesthetic appetite. 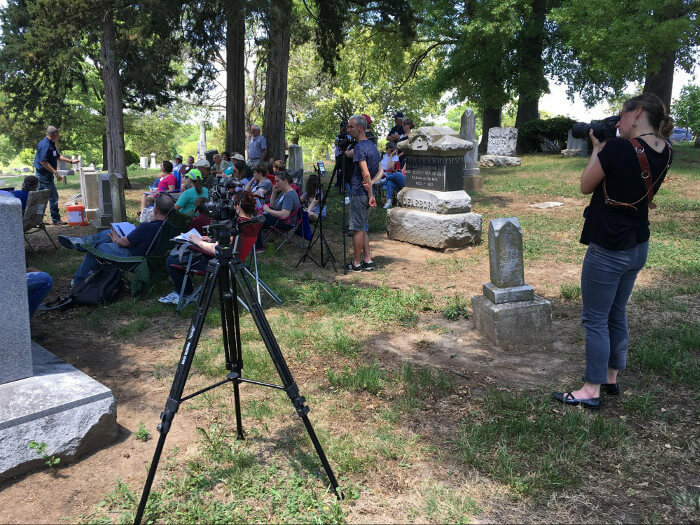 A team that includes Director Matt DeSarle (taking photo), cinematographer Eric Scherbarth (center), and photographer Kristol Kumar work a Matty D. Media video production during a cemetery preservation workshop.